At the eight annual meeting held on Easter Sunday 4th April Dr Stuart Crosbie was confirmed as the new President. I copy Stuart’s acceptance speech directly into this editorial. Thanks Richard (Richard Kemp was Chairperson for the Annual Meeting) for your words of encouragement and for continuing in your long-serving role as Vice-President in which you graciously keep the Society on an ‘even keel’ when the going gets tough and point out when we stray from our mandate. It’s great to have Mark & Heather with us today even although they are challenged by health issues. As your incoming President, I’m both humbled and a little in awe as I step into their shoes. Unlike Mark and Heather, I don’t live locally and I’m not retired. So it means I will have to operate somewhat differently. In thinking through how we might improve the way we operate, I recalled a world famous author and speaker on teamwork and group dynamics by the name of Peter Scholtes. I remember him giving the key-note address at an Australian Business Excellence conference and beginning by saying that he got very easily confused ….. and he considers it one of his strengths! He went on to say that leaders of successful organizations basically have a three pronged focus – Purpose, People and Processes. And they all have to be in synchronization. So what does that mean for the Advocates? So thanks to all Committee Members who agreed to be re-elected and a special welcome back to John Wheeler after a period of ill-health. Before leaving the people side of things, there is also the imperative of building good relationships with our key stakeholders ….. and our Committee has a good balance of local and national networks to be able to do this well. The other P is process. We have been the recent recipients of a Huckleberry’s grant that has enabled us to purchase the electronic equipment you see here today. I believe it can be used in all sorts of ways, including transforming how we run our Committee Meetings (which we will be experimenting with when we next meet). But there are other ways we can work smarter also, particularly by making better use of the internet and our web-site for both communicating with members, and having Committee Members utilizing working documents through secure access to restricted parts of our site. 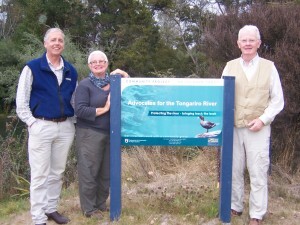 and thereby be effective Advocates for the Tongariro River. I look forward to your ongoing support. Thank you.